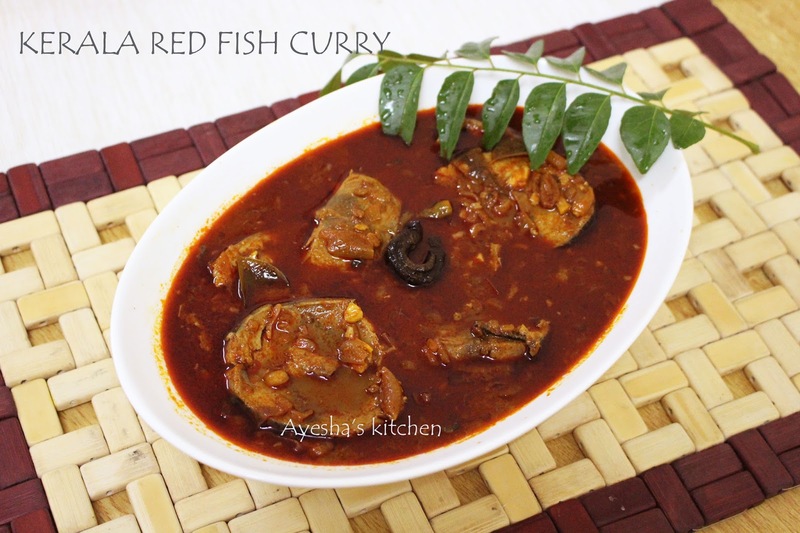 Red hot spicy fish curry with gambooge (kudampuli) is one of the most popular and favorite dishes of Kerala. The name itself gives a mouthwatering feel. For most of the Keralites, lunch is incomplete without a tangy spicy fish curry. 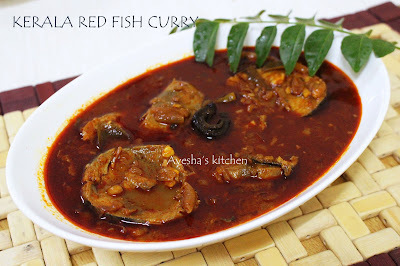 So today lets see how to make a delectable Redfish curry with Tuna fish(choora meen). The cuisine of Kerala is popular for its delectable fish and seafood delicacies. The Keralites are always passionate for fish curry meals. They often served meen curry or red fish curry along with mashed tapioca (kappa puzhungiyath) or with hot steamed rice. The most interesting fact in the preparation of spicy fish curry is the use of clay pot (manchatti) and gambooge. Both together gives the real earthly flavor to curries. Spicy fish curry is one of my favorites, one of the tastiest and the easiest fish recipe. Fish curry with coconut or coconut milk is the other fish recipe which is liked by most of the malayalees. I love the reddish textured curries but i prefer mildly spiced curries only. For such people here is the TIP. Use kashmir chili powder instead of normal red chili powder. And sauteeing the spices in oil along with salt in a low flame gives the real lovely texture to the curries. Maybe most of us know this tip but still some won't. So try to taste this recipe and do let me know your feedback. Here is the recipe of kerala spicy fish curry, red hot fish curry, Kappa meen curry. Enjoy!!! Heat few tsp of oil in a clay pot and when hot make the flame medium low. Add mustard seed and when spluttered, add the chopped shallots, green chili, curry leaves and ginger garlic paste. Saute well until shallots turn golden and the raw smell goes off. Transfer it to plate. Now make the flame very low and heat few tsp of oil and add the spice powders like kashmir chili powder, turmeric powder, fenugreek powder. Adding some salt along with the spice powders when sauteing helps to get rid of choking or coughing. (Sauteing the spice powders in low heat oil gives the reddish texture to the curry).Saute well for few minutes and when done add the sauteed onion gravy to it. Then add the pureed tomato and gambooge saute for a while, then add some water ( 1 cup) and required salt. Mix well and allow it to boil, stirring occasionally. Do not add more water. When done, add the fish slices and gently mix to coat the fish in the gravy. Simmer for 10 minutes or until fish is cooked. Then swirl the clay pot and off the flame. Now you can either temper it with some chopped fried shallots and curry leaves or you can just pour some hot coconut oil on the top. Let it stay for half an hour and is best when served along with cooked mashed tapioca or steamed rice.